The last Monday of August is a non-working holiday in the Philippines in celebration of National Heroes Day. 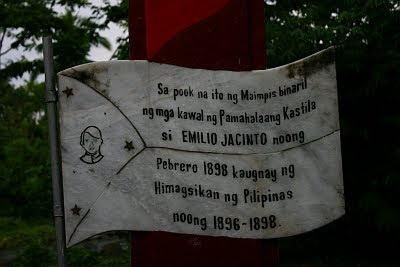 Emilio Jacinto was the young adviser of Katipunan Supremo Andres Bonifacio and the acknowledged "Brains of the Katipunan" for having prepared many Katipunan documents including the constitution and the Kartilya ng Katipunan. He's known in Katipunan circle as Pingkian. The oath of the pledges: "Sa Mga Kababayan," "Pahayag," and "A La Patria"
In February 1898 during the Philippine Revolution, he was wounded in a skirmish with Spanish riflemen in Maimpis (a barrio of Magdalena town), brought to the Catholic Church of Magdalena but was denied refuge and treatment. He was taken instead to Santa Cruz Church where a doctor treated his wound. To evade capture by the Spaniards, he used a pass that belonged to Florentino Reyes, a Filipino spy captured before the Maimpis encounter. Tutubi chanced upon an old forsaken maker of Emilio Jacinto on the national highway in Magdalena, Laguna commemorating the battle of Emilio Jacinto. Opposite the marker is Bahay ng Laguna, a museum dedicated to the former Laguna governor Felicissimo San Luis. 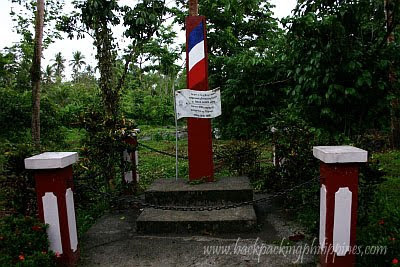 Emilio Jacinto was made the leader of the Katipunan in Laguna where he established his secret headquarters in the town of Majayjay. He died at a young age of 24 due to malaria. What makes a person a national hero? Legislation did not make one for there's really no Philippine law declaring a person as such; there's only popular acclaim, even in Jose Rizal's case. hmmm... oo nga. dapat na sigurong magkaroon ng clear-cut policies about declaring one as a hero. at kung dapat ba siyang ilibing sa libingan ng mga bayani. Did not know about this marker. Is it located near the church? I only saw the spot where Jacinto's blood stained the floor of the Magdalena Church. True. We have no clear rules on how to declare a person a national hero or even commemorating an event historical. I agree with historian Teodoro Agoncillo. History should be written several years after the event took place... when emotions and its popularity has desipated and what's left are only facts and historical records. By the way bro. I lost my phone while commuting in Commonwealth. You can strike out my old number. He didn't live very long, shame to see such an special person die so young.